Mulesaw: I really ought to start working on something. I really ought to start working on something. A good thing about growing up is that once in a while you can recognize a pattern if it has happened before. If you are sufficiently smart - you might even know how to deal with it based on last time you experienced the same thing. If I don't do any sort of woodworking for a month or so out here, I inevitably end up fantasizing about projects whenever I have to stay put in the control room due to the ship being within the 500 m zone of an offshore installation. Normally I tend to concentrate my thoughts on one type of project: Boats, Timber framing, workbenches etc. But other times like this period, I have considered almost all of those regular projects. Plus a few other ones. Then I sort of shifted into timber framing for a couple of days, and then suddenly I was considering doing a backsaw project. 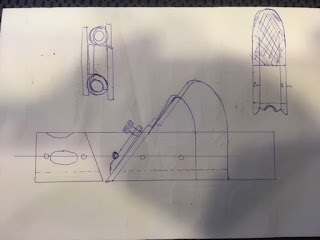 After sketching and thinking about backsaws for a bit of time, the most natural course for my imagination was to work on how to make a saw tooth stamping machine. The saw tooth stamping machine was strangely stopped by the logical part of my brain (a very small part) after convincing myself that I could most likely make a couple of saws before even finishing the machine, if it had to work all right. On a side note, one of the ideas was to use the lathe, and have the blade revolving in a clamp-type structure. Then I could use the screw cutting pitch to make the teeth. I have a couple of backsaws at home, and I doubt that I will ever wear them out, so while it is still fun to build one, I wouldn't know what to do with it. Except for putting it in the Sunday tool drawers together with the other tools that are so nice that I can't really get my self to use them on a daily basis. I started looking at older entries on my blog, and somehow I ended up looking at the infill smoother I made last year. I haven't used it a single time! It took a long time to build, and there wasn't much wood involved. But somehow I managed to convince myself that it was actually a nice cosy manageable project to do again. But who needs two infill smothers? I suppose that I could make a block plane sized infill, but I didn't really see the need for that. Making an infill would also require me getting some brass and some decent wood for the project, but I could bring that with me for the next time out here. So those obstacles couldn't stop my brain from keeping on with that imaginary project. So I started loosely sketching an infill chamfer plane. After some time I decided that it would probably never see any use due to my two Japanese chamfer planes that work brilliantly. So it would be a waste of time to build one. But if I on the other hand made an infill moulding plane, then I would have something that would look fine, and maybe occasionally see a little use. More sketching, and suddenly I had this small prospective infill that might be possible to build. The only example I could find online of a similar plane was a guy in Finland who has made an infill with exchangeable irons. Kind of an infill combination plane. I on the other hand want mine to just be a small square ovolo shape. I can't really think of a good explanation to why I should build an infill ovolo plane other than it would make a pretty little plane, and it would be fun to see if it was possible. I have tried to weigh the pros and cons regarding if it should be a sprung type plane or an unsprung type. So far it seems as though the sprung type will be a bit easier to make as an infill type. But that could easily just be my desktop dreams that fools me. Another option is to stop inventing new strange projects, and just wait for the trip home, and then next time start a nice little box like project. That is definitely the most sensible thing to do based on my vast experience in this type of situations..
Design phase of infill ovolo moulding plane. Hi Jonas! This plane looks like an interesting project. I think one reason you don't see infill moulding planes is because getting a metal bottom to reflect the shape of the molding seems like it could be more work than it's worth. But, not really having any metal working knowledge, I don't really know. It looks like you get past that by using a wooden bottom? I.e. there is just metal stuck to the outside faces of the plane. If that's the case, may I recommend a Krenov-style laminated plane? Just thinking out loud here, but wooden cheeks would simplify the build (although might not look as impressive). I look forward to seeing what you do with this build. I kind of hope that this plane will never be made. It was more to show my frustrations about not having done any real stuff this time. The bottom was supposed to be made out of metal. I think that I can use the lathe as a milling machine, and make the moulding shape fairly easy - at least compared to filing it. But I have decided that if I am hoing to build something like this, I want to use brass for the sides and bottom, just because it is a lot easier to work than steel. And i looks better for an infill. I would also need to find something to use for the iron, so there are lots of obstacles still. Jonas, I am in your boat, but I have an idea. A few months back I had to replace part of the floor in my attic so I purchased (6) 4ft x 4ft sheets of 1/2" Baltic birch plywood because it was on sale for the same price as the rough stuff. After I was finished I still had nearly a full sized piece as well as some useable off-cuts. I am in need for another medicine cabinet sized storage piece for my garage for paints/stains etc. So I plan on using it to make one of those. In and of itself this may not seem all that exciting, but my plan is to use it making only a table saw and router as well as use pocket screws for the joinery. As you know, I have been a mostly hand tool woodworker for 7 years, but I am now taking a stand against all hand tool bullies. I am guessing that my use of pocket screws on plywood sized with a table saw and milled by a router may cause great pain and suffering among some "real woodworkers", but that is my plan. I think it sounds like a great idea to make a a stains cabinet from the surplus plywood. Actually I think that a table saw and a router are the best tools for working plywood, so that is probably what I would have chosen too. If it wasn't for me being too cheap to buy nice plywood. Now plywood is incredibly strong, and I have seen and read about several real woodworkers who have used stuff like that for e.g. drawer bottoms etc. If you really want to mess around with the dark force, you should get some MDF. That will for sure get you banned in a lot of places (but not on this blog). I have never tried pocket hole joinery, not that I haven't wanted to, but I have never seen a jig for it for sale in Denmark. I actually tried to ask about it in the pro department of the local lumberyard. And they told me that I was the second customer ever to ask about such a jig, and they had never heard about such one. I am actually looking forward to seeing a plywood build. Like you say, it is not something that is often seen or discussed openly. I have been down this infill molding plane thought hole. My plan was to replicate the style of the Marples ultimatum braces (in brass and ebony) in some way in hollows and rounds. https://www.toolsforworkingwood.com/store/blog/565/title/A+Close+Look+at+an+Ultimatum+Brace Of course it's unneeded and dumb, especially since I have a nice half set of hollows and rounds I don't use often (or at all if I'm honest) but man would it be cool. http://www.sihistin.fi/en/tools/infill though this is not exactly what I had in mind. I'll give away another project idea I've had in mind that might scratch a similar itch. Marples? made a cast mallet shell that had a replaceable infill portion (a spectacular similar specimen is in the Studley chest) I've thought that the shell could be made with the double dovetail method with some success. That link to the Finnish guys page is the same as I had found. The brace you linked to sure looks good, but I agree that it might not be that needed to make one. (Not that it should keep anyone from doing it). I have a couple of old wooden moulding planes that I never use, so in theory I don't need one either. But it always happen at the end of a period at sea, that I start dreaming up new weird projects. I actually ought to stop it and just do some regular small stuff. The infill hammer idea sounds interesting. And I think that you are correct that it could be made with the double dovetail method. I guess it isn't any worse doing a "weird" infill project that will never see any use, than making a small spice cabinet etc. that will never be completed and also never be used. As long as we acquire some sort of skill while doing it, I think it is OK. But I know that to me it still feels "wrong" to spend say 50$ on materials and make a beautiful tool that you will never use. On the other hand, few people will think twice about spending 50$ for a couple of Pizzas and beer. Despite the fact that the time span for that purchase is considerably shorter than the time enjoyed in your shop while building something. But I rarely spend money on that either coming to think of it. Jonas (who is kind of cheap). Are woodworkers generally a conservative bunch?